Woah. This trailer popped up in our Facebook feed the other day. It's for a new HBO movie coming out in a few weeks. It stars Mad Men's Jon Hamm and Curb Your Enthusiasm's Larry David, which is enough to have us pretty excited. Hell, it looks like it'll be worth it just for Larry David ridiculous beard. Plus it'll have Kate Hudson, Philip Baker Hall, Michael Keaton, Eva Mendes and Danny McBride. And it was directly by Greg Mottola (the same guy who also did a bunch of Arrested Developed and Undeclared plus Superbad and Adventureland). 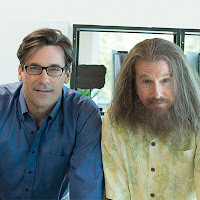 Clear History hits TV screens on August 10.